I was in the mood for dressing up my nails today...so I figure, I'd do a tutorial while I'm at it. 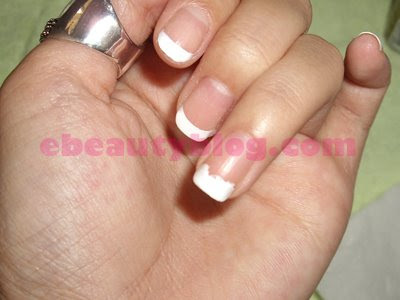 I know many of you probably know how to create french tip nail already, if not, then here's a tutorial for you. 1. Start off by locating your natural curve line. It's the white part of the nail that curves around the top. Then apply white nail polish to the tip of that natural curve on every fingernail. Repeat the same process with a second coat of nail polish. Notice, it's not necessary for the lines to be even and perfect at this point cause we're going to fix that later. 2. Now, to even out the manicure lines. Pour a small amount of acetone into the bowl. Lightly dip your brush into the acetone. 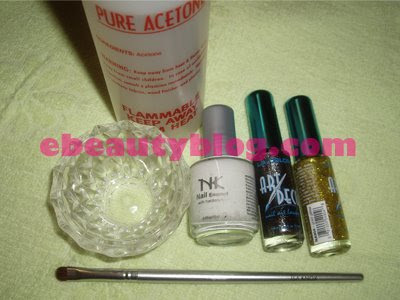 Make sure that the brush is not too wet w/acetone before you brush it on the nails. 3. Place the brush right in the middle of the nail underneath the while polish. Gently move it from left to right making a round curve. 4. ~Optional~ I got this nail glitter at a local accessory store today for about $2-3. I thought it'd be fun to add glitters onto the nail tips. It was pretty easy to brush on since the tip is small. Perfect for an outline on the tips. 5. After the nail dries, brush on top coat to keep it shinny. very pretty! I'm loving your iphone case. wow...i love french tip! it's my ultimate favorite!!!! very nice instructions, i nether used the brush before for make the line more smooth, ujually just try to drow it nice. If you are looking for new ideas of nail art, visit my blog, where i post a pictures of the nails that i make. where did you get the brush from? Sandy, I used my Isa Knox makeup brush. 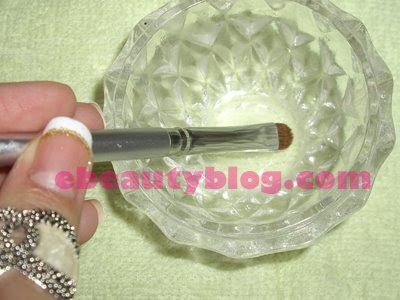 You can get nail art brush at many beauty supply stores or go to Michaels. I believe they carry some brushes that you can definitely use for nail art. Cool story you got here. It would be great to read a bit more about this matter. Thanx for giving that information. i bloggeed this! Nice tip techinique! My nail naturally white at the edge! I don't have to do anything. Lucky me! :) Love ur blog though! really love it! very well done!